Qosina offers a variety of channel clips that are in stock and ready for immediate delivery. Qosina part #12562 is a 2-channel multi-cavity clip with a guide wire slit, designed to secure guide wire dispensing tubing while also securing a the guide wire itself. 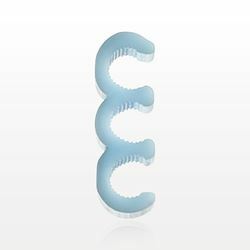 Made of Kraton (HDPE), this natural channel clip features 0.148 inch channels and is flexible, allowing for easy connection to guide wire dispenser tube coils. Qosina carries a large selection of catheter and guide wire accessories for all your component needs. Qosina offers a variety of channel clips that are in stock and ready for immediate delivery. Qosina part #12535 is a 2-channel multi-cavity clip with a guide wire slit, designed to secure guide wire dispensing tubing while also securing the guide wire itself. 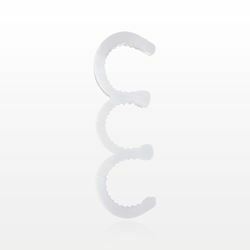 Made of TPV (thermoplastic vulcanizate), this natural channel clip features 0.152 inch channels and is flexible, allowing for easy connection to guide wire dispenser tube coils. Qosina carries a large selection of catheter and guide wire accessories for all your component needs. Qosina offers a variety of channel clips that are in stock and ready for immediate delivery. Qosina part #12537 is a 2-channel multi-cavity clip with a guide wire slit, designed to secure guide wire dispensing tubing while also securing the guide wire itself with a 0.011 inch slit. 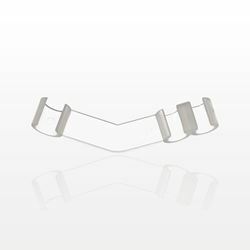 Made of TPV (thermoplastic vulcanizate), this natural channel clip features 0.144 inch channels and is flexible, allowing for easy connection to guide wire dispenser tube coils. Qosina carries a large selection of catheter and guide wire accessories for all your component needs. Qosina offers a variety of channel clips that are in stock and ready for immediate delivery. Qosina part #12538 is a 2-channel multi-cavity clip with a guide wire slit, designed to secure guide wire dispensing tubing while also securing the guide wire itself with a 0.022 inch slit. 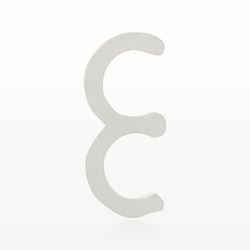 Made of TPV (thermoplastic vulcanizate), this natural channel clip features 0.144 inch channels and is flexible, allowing for easy connection to guide wire dispenser tube coils. Qosina carries a large selection of catheter and guide wire accessories for all your component needs. Qosina offers a variety of channel clips that are in stock and ready for immediate delivery. Qosina part #12539 is a 2-channel multi-cavity clip with a guide wire slit, designed to secure guide wire dispensing tubing while also securing the guidewire itself with a 0.007 inch slit. 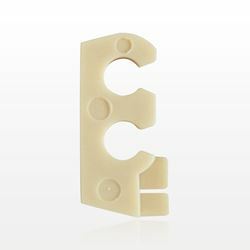 Made of TPV (thermoplastic vulcanizate), this natural channel clip features 0.144 inch channels and is flexible, allowing for easy connection to guide wire dispenser tube coils. Qosina carries a large selection of catheter and guide wire accessories for all your component needs. Qosina offers a variety of channel clips that are in stock and ready for immediate delivery. Qosina part #12536 is a 2-channel multi-cavity clip with a guide wire slit, designed to secure guide wire dispensing tubing while also securing the guidewire itself with a 0.011 inch slit. 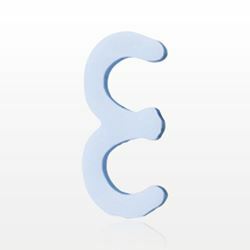 Made of TPV (thermoplastic vulcanizate), this natural channel clip features 0.142 inch channels and is flexible, allowing for easy connection to guide wire dispenser tube coils. Qosina carries a large selection of catheter and guide wire accessories for all your component needs. Qosina offers a variety of channel clips that are in stock and ready for immediate delivery. Qosina part #12531 is a 2-channel multi-cavity clip with a guide wire slit, designed to secure guide wire dispensing tubing while also securing the guide wire itself. 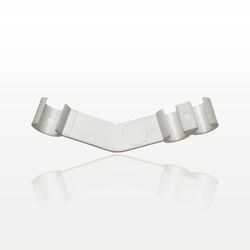 Made of TPV (thermoplastic vulcanizate), this white channel clip features 0.142 inch channels and is flexible, allowing for easy connection to guide wire dispenser tube coils. Qosina carries a large selection of catheter and guide wire accessories for all your component needs. Qosina offers a variety of channel clips that are in stock and ready for immediate delivery. Qosina part #12552 is a 2-channel multi-cavity clip designed to secure guide wire dispensing tubing. Made of PP (polypropylene), this blue channel clip features 0.145 inch channels. Qosina carries a large selection of catheter and guide wire accessories for all your component needs. Qosina offers a variety of channel clips that are in stock and ready for immediate delivery. Qosina part #12506 is a 2-channel multi-cavity clip designed to secure guide wire dispensing tubing. 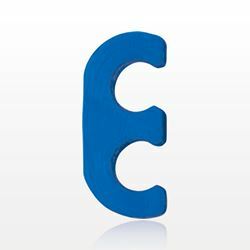 Made of HDPE (high density polyethylene), this dark blue channel clip features 0.158 inch channels. Qosina carries a large selection of catheter and guide wire accessories for all your component needs. Qosina offers a variety of channel clips that are in stock and ready for immediate delivery. Qosina part #12511 is a 2-channel multi-cavity clip designed to secure guide wire dispensing tubing. Made of PE (polyethylene), this light blue channel clip features 0.143 inch channels. Qosina carries a large selection of catheter and guide wire accessories for all your component needs. Qosina offers a variety of channel clips that are in stock and ready for immediate delivery. Qosina part #12553 is a 2-channel multi-cavity clip designed to secure guide wire dispensing tubing.  Made of PP (polypropylene), this natural channel clip features 0.145 inch channels. Qosina carries a large selection of catheter and guide wire accessories for all your component needs. Qosina offers a variety of channel clips that are in stock and ready for immediate delivery. Qosina part #12522 is a 2-channel multi-cavity clip designed to secure guide wire dispensing tubing.  Made of HDPE (high density polyethylene), this natural white channel clip features 0.143 inch channels. Qosina carries a large selection of catheter and guide wire accessories for all your component needs. Qosina offers a variety of channel clips that are in stock and ready for immediate delivery. Qosina part #12525 is a 2-channel multi-cavity clip designed to secure guide wire dispensing tubing. 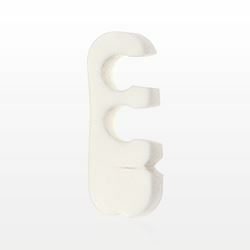 Made of HDPE (high density polyethylene), this white channel clip features 0.215 inch channels. Qosina carries a large selection of catheter and guide wire accessories for all your component needs. Qosina offers a variety of channel clips that are in stock and ready for immediate delivery. Qosina part #12515 is a 3-channel multi-cavity clip designed to secure guide wire dispensing tubing. Made of PE (polyethylene), this natural channel clip features 0.143 inch channels. Qosina carries a large selection of catheter and guide wire accessories for all your component needs. Qosina offers a variety of channel clips that are in stock and ready for immediate delivery. Qosina part #51522 is a 3-channel multi-cavity clip with two 0.143 inch channels and one 0.210 inch channel positioned on the side, designed to hold a flush adapter in place. Made of HDPE (high density polyethylene), this natural channel clip keeps guide wire dispenser tubing in place. Qosina carries a large selection of catheter and guide wire accessories for all your component needs. Qosina offers a variety of channel clips that are in stock and ready for immediate delivery. Qosina part #51534 is a 3-channel multi-cavity clip designed to secure guide wire dispensing tubing. Made of PE (polyethylene), this natural channel clip features 0.355 inch channels. Qosina carries a large selection of catheter and guide wire accessories for all your component needs. Qosina offers a variety of channel clips that are in stock and ready for immediate delivery. Qosina part #12523 is a 3-channel multi-cavity clip designed to secure guide wire dispensing tubing. 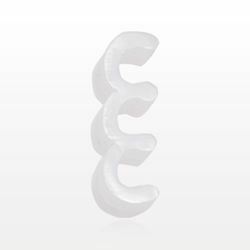 Made of HDPE (high density polyethylene), this natural white channel clip features 0.143 inch channels. Qosina carries a large selection of catheter and guide wire accessories for all your component needs. Qosina offers a variety of channel clips that are in stock and ready for immediate delivery. Qosina part #12514 is a 3-channel multi-cavity clip designed to secure guide wire dispensing tubing. 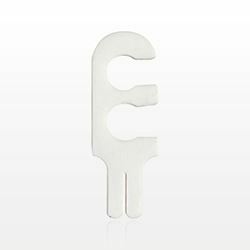 Made of HDPE (high density polyethylene), this natural white channel clip features 0.205 inch channels. Qosina carries a large selection of catheter and guide wire accessories for all your component needs. 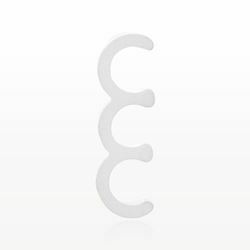 Qosina offers a variety of channel clips that are in stock and ready for immediate delivery. Qosina part #12532 is a 3-channel multi-cavity angle clip designed to secure guide wire dispensing tubing. 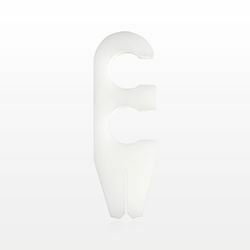 Made of PP (polypropylene), this natural channel clip features two 0.2 inch channels and one 0.24 inch channel. The angled clip design can create space between a flush adapter and guidewire dispensing tubes when in use. Qosina carries a large selection of catheter and guide wire accessories for all your component needs. Qosina offers a variety of channel clips that are in stock and ready for immediate delivery. Qosina part #12533 is a 3-channel multi-cavity angle clip designed to secure guide wire dispensing tubing. 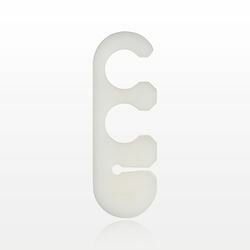 Made of PP (polypropylene), this white channel clip features two 0.2 inch channels and one 0.24 inch channel. The angled clip design can create space between a flush adapter and guidewire dispensing tubes when in use. Qosina carries a large selection of catheter and guide wire accessories for all your component needs. Qosina offers a variety of channel clips that are in stock and ready for immediate delivery. Qosina part #12554 is a 3-channel multi-cavity clip designed to secure guide wire dispensing tubing. Made of PP (polypropylene), this blue channel clip features 0.145 inch channels. Qosina carries a large selection of catheter and guide wire accessories for all your component needs. Qosina offers a variety of channel clips that are in stock and ready for immediate delivery. Qosina part #12507 is a 3-channel multi-cavity clip designed to secure guide wire dispensing tubing. Made of HDPE (high density polyethylene), this dark blue channel clip features 0.158 inch channels. Qosina carries a large selection of catheter and guide wire accessories for all your component needs. Qosina offers a variety of channel clips that are in stock and ready for immediate delivery. Qosina part #12555 is a 3-channel multi-cavity clip designed to secure guide wire dispensing tubing. 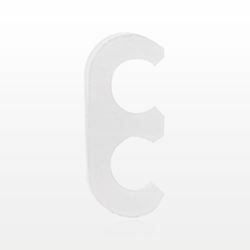 Made of PP (polypropylene), this natural channel clip features 0.145 inch channels. Qosina carries a large selection of catheter and guide wire accessories for all your component needs. Qosina offers a variety of channel clips that are in stock and ready for immediate delivery. Qosina part #12529 is a 3-channel multi-cavity clip designed to secure guide wire dispensing tubing. 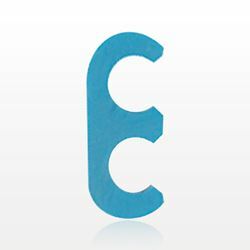 Made from a blend of HDPE and LDPE, this light blue channel clip is serrated and features 0.140 inch channels. Qosina carries a large selection of catheter and guide wire accessories for all your component needs.